We made a couple of changes to make Goals a bit simpler. 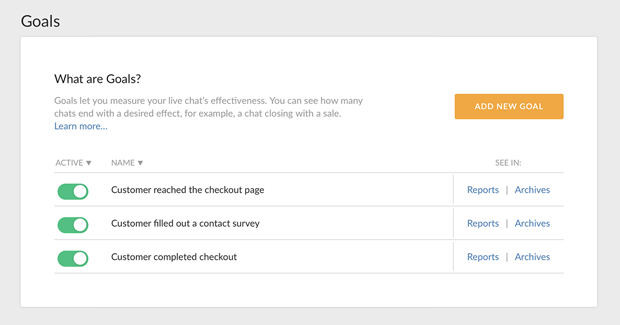 First off, Goals are now available in a new Ecommerce section in your LiveChat settings. The Goals section itself is now easier to use and gives you a quick access to the associated reports and all chats that ended up with a Goal. You can use Goals to see how many chats end with a result like getting a sale or customer signing up for your services. Check out the new Goals section and start measuring your LiveChat wins!